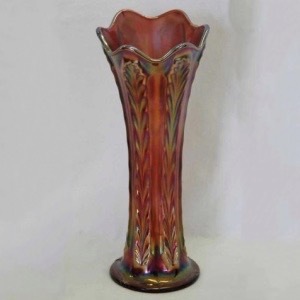 Pattern Description: Standard vase on a round flat base with six panels of vertical plumes that start a the bottom and reach almost to the top. 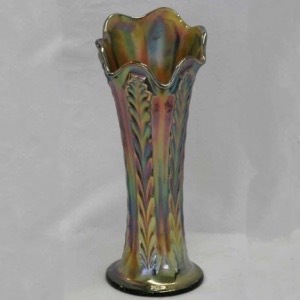 This pattern is characterized by six panels on an 8″ to 14 1/2″ tall vase with vertical, raised plumes starting near the bottom and ending in a rounded top. The top of the base is six flames (usually rounded or ruffled). 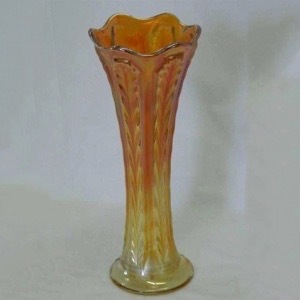 The base size is 3 1/2″. 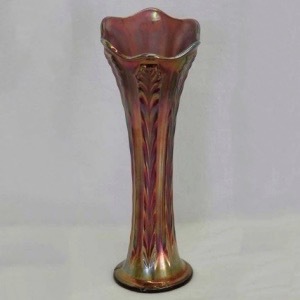 It was presumably made during the 1920's since that was when Fenton started making red colored pieces in carnival glass.